I imagine that BD/DVD revenue will continue to decline, but I seriously doubt that streaming will make for that lost revenue indefinitely. Do you mean SVOD (Netflix/Hulu/Etc.)? (last year's revenue is calculated using the weekly YoY figures rather than what was reported last year, as sometimes the numbers will change). As 2016 BD Revenue was slightly higher than 2015 BD Revenue, it struck me as strange that you show a negative BD YoY. I'm still not clear on how you use weekly YoY figures. Can you be a bit more specific? My figures are a summation of the 52 HMM reports. The DEG reported a slight increase, but it was probably less than 1 percent. In any case they are two different sources and the results are very close in any case. Usually HMM is the only source of BD sales info but sometimes we get it from the DEG as well and I would give the DEG more weight whenever there is a difference. Everything. The public is so used to getting streaming for free or next to free that it will take years for it to make the money the optical discs have made over the last nearly 20 years. I'd have to look at his log to see what going on. I'd be glad to if I could see them. HMM has never published annual numbers and the DEG has always considered Blu-ray and DVD as a single category in their table. 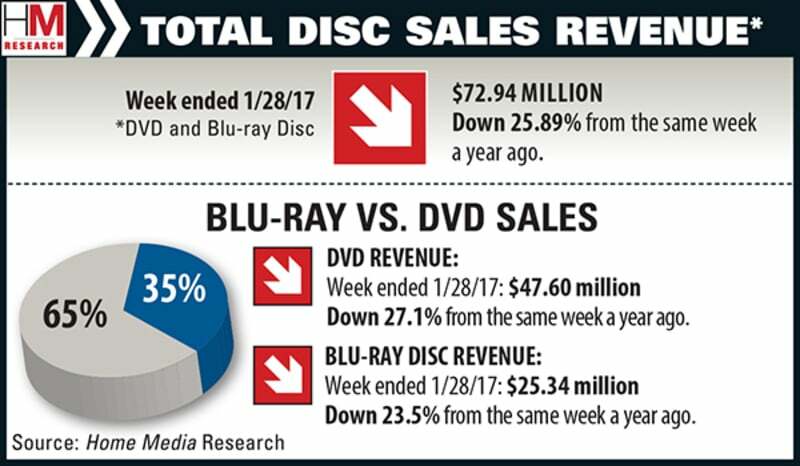 They only mention Blu-ray sales when it does relatively well. Unfortunately, I can't convince my friend to join the conversation, Bruce. He is a long time BD supporter and feels that your decision to arbitrarily chose different sources of data for different weeks negates the validity of your results. He also understands that DEG and HMM weekly reporting intervals end on different days, so mixing those sources leads to inaccuracies. Too bad that neither HMM or DEG publish their own annual BD revenue numbers. I can't help but wonder why. That's ridiculous. My data is entirely from the HMM weekly reports. I do compare the two sources whenever the DEG chooses to reveal separate BD data. But I never mix them. Show me where they are mixed. Do you or your "friend" (who for all I know may be the same person) even know how to read my table? Anyway its very cowardly to discredit someone's data while choosing to remain anonymous with their own. I suspect that it's because of fears that this anonymous data will be proven wrong. If my data is wrong, it's only because there may have been an entering mistake, but not because of my methodology, or "mixing" data. If you see a mistake, then point it out. After all, my data is public in several forums for all the world to see. You would actually be contributing something useful rather than sharing ignorant conclusions from an anonymous friend who has something to hide. BTW, you say his/(or your) BD YoY is "significantly" higher. What is that figure? Or is that a secret too? Didn't mean to offend or discredit your reporting - I always enjoy reading your posts. I really do have a friend who keeps his own HMM records and calculates his own YoY BD performance (which he had at 5.7% at the beginning of December). He doesn't believe in sharing his data on a forum for reasons I don't fully understand, but I thought I would take a shot at resolving the differences. He misinterpreted your sentence from a prior post "Usually HMM is the only source of BD sales info but sometimes we get it from the DEG as well and I would give the DEG more weight whenever there is a difference." I'm still not entirely clear what you were referring to there, but it is clear now that you weren't referring to weekly HMM reports. I don't know. Without being able to see his data I have no way of knowing where the differences lie. Only your friend (and perhaps yourself) would know that. Doesn't take very long to cross check data if one is really curious. 5.7% from the beginning of December is much higher than the EOY, but December was a really bad month. And since the weight/effect of those weeks is much greater due to higher sales revenue, it would affect the results much more than a bad July. I don't remember what mine was for the beginning of December, but it was much higher than -0.5% too. I will double check my entries for any errors when I get a chance. Thank you for the kind reply and for your interest. Edit: Just checked and my YoY as of 12/3/16 was 2.13%. So a significant difference. Does you friend used the corrected past year figures, (which is simply derived from the YoY gain/loss from each week) rather than what was reported (and entered on his spreadsheet) at the time? That may be why there's a difference. Or maybe he uses different starting or ending weeks (I based my weeks on whatever Tuesday the year or quarter falls under). Who knows. Last edited by bruceames; 02-09-2017 at 01:11 PM.. The British consulting firm FutureSource has global BD revenue for 2016 at 2% growth - consistent with yours. No word from my friend yet, so I'll go with what we've got. Thanks! Off to a really bad start this year, but then last year was the opposite.